I was traveling from Virginia to Central Maine to spend some time with my folks during Thanksgiving. It was raining real hard so driving was becoming very difficult. I was not getting any help on the driving front because my spouse was sleeping. The sky was becoming very dark and I was getting a feeling that things were going to turn sour real fast. It was the smell of the Turkey, time spent with my siblings that I was thinking about. I really do believe this is the best holiday of any of them. Family getting together and having a great dinner. The folks will be so happy to have their children and grand child for Thanksgiving. The smiles on their faces, the drinks, and football. I heard a screech and the car in front of me is going sideways, fishtailing, roads are getting slippery now. The road were getting horrendous and I was slowing the vehicle down to keep safe. We were moving into Southern, Maine over the Portsmouth Bridge when the snow was coming down so hard on Highway 95. The traffic was still moving at a clip when off to the side I noticed a speed limit sign. Wow, when did they move the speed limit up to 75 mph? I asked my wife. Can you believe that, people are going to kill themselves going that fast. I nodded and agreed with her. Still moving North and traveling very fast the car in front of me started slipping and crossed the centerline. The vehicle crashed into a semi, blowing the car into pieces, debris flying through the air. The debris kept flying and smashed my windshield and something hit me hard. The lights went out. I woke up with dust flying through the air. It was the dust from the airbag. I instantly thought of my wife, how she was doing. I look over and only see her starring into nowhere. Her eyes not blinking. The debris had gone through the window striking her in the chest area. I had lost my love, the only one who understood me, my hugger. What was I going to tell my family, it was going to tear me apart. The ambulance and fire personal came to our assistance. They dragged her out of the car, looking with a sad face, I knew there was nothing they could do. I was brought to a police car to be questioned and checked to see If I had been drinking. No officer, I told you I haven’t had a drink. The officer responds with me having to walk the line to check for sobriety. I think you need to settle down Mr. or I’m going to take you to jail. I guess I didn’t settle down and I was looking between bars in a jail. Where had everything gone wrong? I was alone, no family and in Jail. I can tell you people and insist that you do not drink and drive this holiday and make other arrangements if the snow make traveling to bad. No person in this world would want to see anything happen to you, Turkey or not. Enjoy the holiday folks, be smart, don’t drink and drive. We have honed our skills here in Maine with shoveling and it is only Jan 5th. We still have a long winter ahead of us. You have to get in shape for shoveling or your going to throw your back out. My method is to take it real easy for awhile on the up stroke. I push the shovel in to gather a good bunch and when lifting I do not jerk myself getting back up. I take it slow from the starting line as you could say. We have been shoveling driveways and sidewalks. Also been shoveling a path for the oil man and also a path for the dog so he can do his thing. It is now time to start with the roofs. This is another skill that we do not get to do very often. The climbing part is not usually the problem. It usually is the falling down part that gets to most of us. 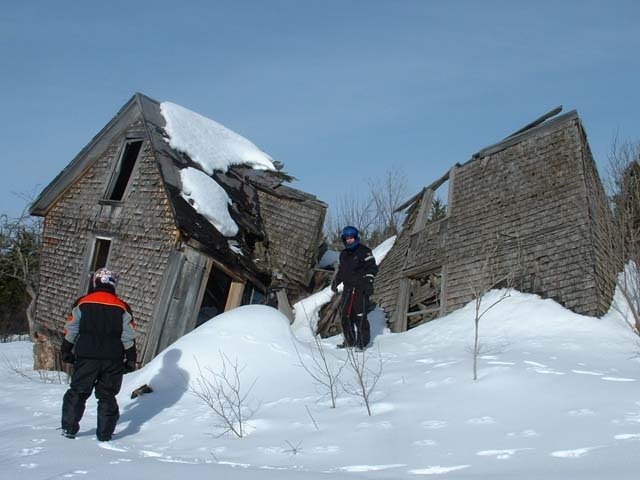 There is not too many Mainer’s that haven’t fallen off a roof at some point in their life. It goes with the territory. We are preparing for a rain event Monday and this will be added weight to the roof or structures. Basically it turns all that snow on your roof into a popsicle. We really have it rough around here in New England. No this is not another country. It is just the name we were giving when they grouped a bunch of colonies way back when. I’m going to brew some coffee and come up with a game plan for the day. I thought it was going to be a day of football but I was told otherwise. The day has been planned and we are going to a delayed Christmas party that was snowed out two weekends in a row. 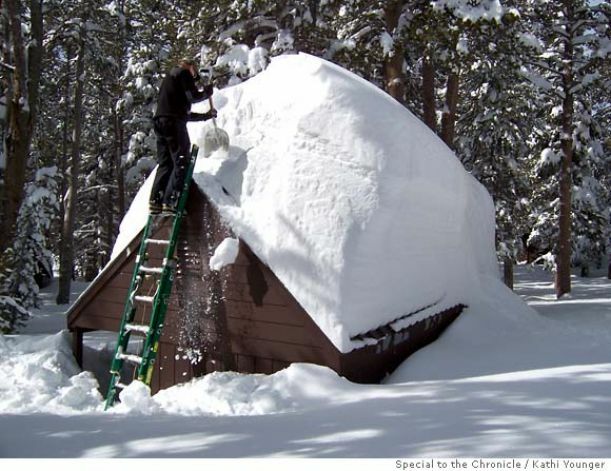 I still have to shovel off my shed which has taking a toll from the previous years. I might not get a chance and you could see a flattened shed come Tuesday morning. Oh Well, give me a chance to build a decent shed. 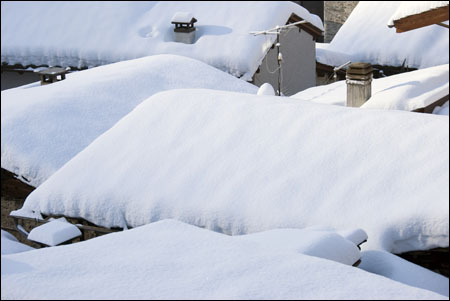 I hope that when you get up on your roof to inspect the amounts of snow that you have, keep a foot planted at all times. Remember things that go up come down. If you have any stories about climbing or falling off a roof I would be interested in hearing about it. I’m sure we all have a story. The kids and I in the neighborhood are in competition on the big sledding hill behind my house. I have never get first place and I know it was because of the sled that I was using. Christmas has brought me a new shiny red sled. It has handles on the side that I can hold onto when trying to curve the sled to keep it on the trail. I know my mom has a box of wax that she uses for making peanut butter balls. I will rub this on the bottom of the sled to make it go real fast. I look out the window from the kitchen and can see all the kids walking up the hill. I better get a move on, where is my mittens? Ok, there they are. Right where I left them last time, next to the register. My snow suit is in the closet so I retrieve that and slither myself into it. Now off to the porch to get my boots. I go into the bread draw and get two bread bags to put over my socks so my feet don’t get wet. I’m all bundled up and now I have a cramp. Oh no! I have to go number you know what. I take my boots off, take off snow mobile suit and run to the restroom. Phew! That was a very close call. I venture out to the big hill and all my friends are there. Big Bernie, Greg, Joel, Chirbair, and Unie. Ok we are at the top of the hill and we all get into position. Big Bernie gives the command and we are off. It is quite a battle between us kids. Whoever gets to the bottom first is the winner of bragging rights for the day. 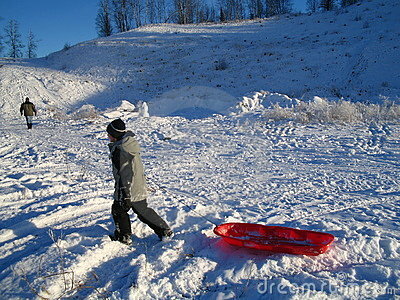 It is a viscious battle to the bottom and old red sled of mine had performed quite well. I didn’t get first but was third for this day. I get a ribbon in my mind and tomorrow I will do better because of this new red sled. I think I’m going to use furniture polish on the bottom for the next race. I can now hear my mother calling, time for supper. This could probably be counted as one of the worst or best trips from hell. The wife and I had planned a trip to Moosehead Lake in Maine. 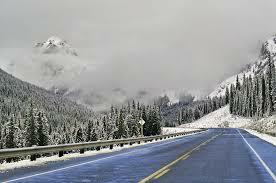 We made plans to go snowmobile riding up there and we rented a room at a local hotel in Rockwood. I decided it was time to get the snowmobile ready before the trip. I started it up, and took a short ride on the back lawn where I live. Something was terribly wrong with the sled. I could hear metal to metal, and crunching sound. This sled was damaged and we had no time to send it to the repair shop before our trip. My wife and I talked, we decided to go buy another snowmobile. We went to the local sled dealer and bought a used sled. Good one too, with a long seat, and longtrack. 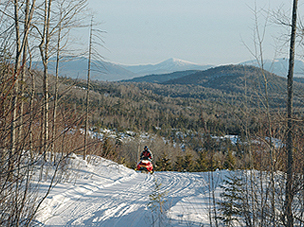 With the sled loaded, we made our way up north. We arrived and checked in. It was still early in the day and we wanted to make our way to Pittston Farms. A place we could go get a cocktail and a bite to eat. We took off across the lake on the pole trail which led us back to land. The first sign I saw stated Pittston Farm this way to the right. I turned and went down the trail, noticing a sign that said snowmobile shop. We went a little further and another sign showed the restaurant going the opposite direction than what the first sign showed. I turned the sled, backing up into deep snow, using the reverse the sled had. We just started the other way when my wife tapped me on the shoulder and said, What is that green stuff in the snow where you backed up? I stopped in the trail to inspect if any damage and anti-freeze was pouring out of my heat exchanger. I remembered the sign, snowmobile shop ahead. I made it to this shop and the repair man told me he didn’t have time to work on it because he was so busy. He said, I can give you a bottle of antifreeze so you can get back to Rockwood. We made it back to Rockwood Hotel and the owners were at their desk. I asked if any snowmobile repair shops around. Hang on a minute the lady said. I could hear her talking. Joe, can you work on a sled? She got off the phone and the guy told her, Yes. His shop was a mile down the road. I loaded the sled into my pick-em-up-truck and off we went. It was time to chill out so we decided to have some cocktails and eat some dinner. It was about 8 o’clock that evening and the owner told us the sled was done and we could pick it up. I brought my truck down and paid the guy. I off loaded my sled at the hotel parking lot and put it back up near the hotel. I went back into the restaurant with my wife and finished dining with her. 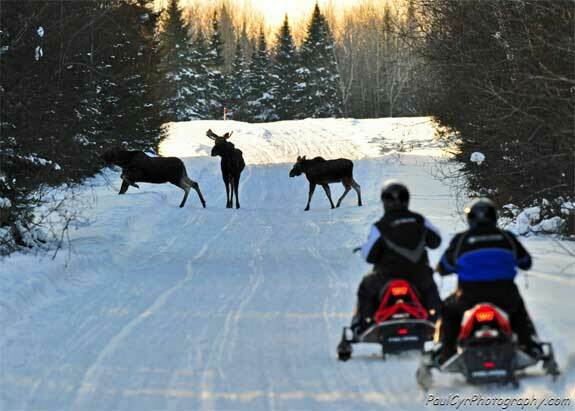 I was looking outside the window, enjoying seeing all the snowmobilers riding around when I noticed a flash of something out of the corner of my eye. I then saw my red pick-em-up-truck jump about five feet sideways. I knew at this moment a snowmobiler had hit my truck at a very fast rate. I jumped up from the table and started running toward my truck . The owner of the hotel was following me because we wanted to make sure no one was injured. When we just about got to the truck, the owner replied; Oh no that is my son. I was floored with that statement. What really happened was his son’s sled did a runaway when he started it. Maybe the throttle was stuck so when there was ignition it took off at a fast rate. The sled was in bad condition along with my truck. We was glad the son was not injured but the damage was severe. The truck still could be driven, we exchanged names and numbers, and waited for a warden to file a report.